On Jan.9, 2017, an annual ceremony was held to honor distinguished scientists and research achievements in Beijing, capital of China. The international S&T cooperation prizes were awarded to five scientists from the United States, Germany and France, and the Mexico-headquartered International Maize and Wheat Improvement Center. John Elmer Kutzbach is one of them. This award is the highest prize for foreign scientist who can have in China. Prof. John Kutzbach, his enthusiastic support and outstanding contribution to science and technology, productive collaboration with China and the training of talents are genuinely appreciated by his colleagues at CAS. With the recommendations from CAS and the reviews and selection made by the national appraisal committee, he won the international S&T cooperation prize of P.R.China. Dr. John E. Kutzbach (born in June, 1937) is a professor, and a long-term director of Center for Climate Research, University of Wisconsin—Madison. He is an internationally recognized first class scientist on climate numerical simulation. He is one of the pioneers and founders in paleoclimate modelling, and he was elected a member of National Academy of Sciences in 2006. As one of the forerunners of paleoclimate modelers, he has studied the responding and feeding back mechanisms in the simulation of changing earth process through groundbreaking connections of climatology, geology and ecology sciences with numerical method of physics and bio-geochemistry. He has successfully revealed the mechanism and driving force of climatic environmental changes at various tectonic to orbital time scales. His findings have opened up a new direction of human beings for a deeper understanding of the past, present and future changes of earth system, which also initiated a new era of public perception of climate science. After he became guest professor of Institute of Earth Environment, Chinese Academy of Sciences in 1980s, he began his 30 years of collaboration with China. 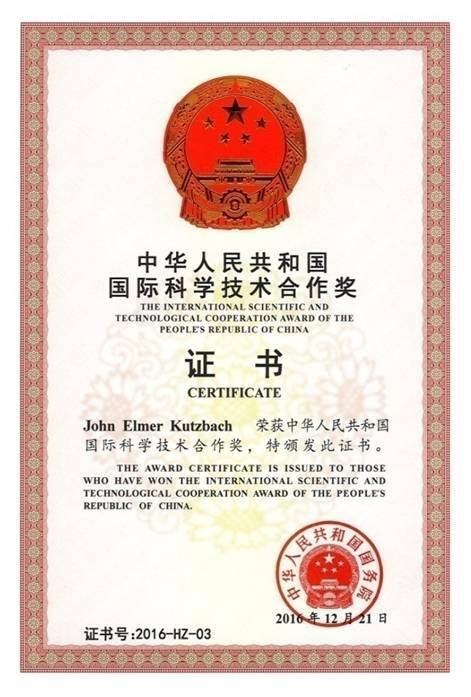 In past 30 years, Prof. Kutzbach passed his new ideas, new techniques and new methods selflessly to Chinese colleagues, and has pushed Chinese earth science into a new stage of dynamic study combining research of traditional geology and numerical simulation. He has promoted the generations of major joint projects sponsored by NSFs of both China and USA. He has made indelible contribution to the fast development of global change study of China. His closely collaborated works and generous help has made many talented Chinese scientists stepping onto the international academic stage and making breakthrough innovations in Earth System Science.